There’s a dark-eyed, dark-haired, petite old woman who lives just outside of my town. Her name is Afton. 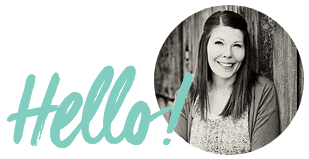 Afton is a kind soul who grew up here in Southern Utah but spent most of her married life traveling the world while her husband became a doctor through the Army. Afton is one of those people who is always so glad to see you and makes you feel so welcome and loved that you secretly know, no matter what anyone else says, you are her favorite person in the world. I adore Afton and miss her other half, Tony, very much. A few years ago, we had a late Thanksgiving dinner at Afton’s. She made Dixie Salad. Dixie Salad is a Southern Utah tradition when it comes to holiday dinners. She told me that the pioneers who settled the St. George area made this dish for their holiday meals, not only because it is delicious, but because they had all of the seasonal ingredients to make it in the winter. Pomegranates grows in St. George, Utah and are ready around Thanksgiving, apples are ready late fall, and the pecans are starting to fall off the tree then too. Add some ever abundant farm-fresh cream for whipping, and you have yourself one delicious dish. Dixie Salad quickly became a family favorite and I look forward to making it again every winter. There’s a little group of blogger who share seasonal dishes once a month (and use the great hashtag #eatseaonal), and I’m over the moon to be joining them this month. I have a passion for eating seasonal and I knew Dixie Salad was just the dish I wanted to share with you this month. Keep reading, there’s a wealth of knowledge in this post! 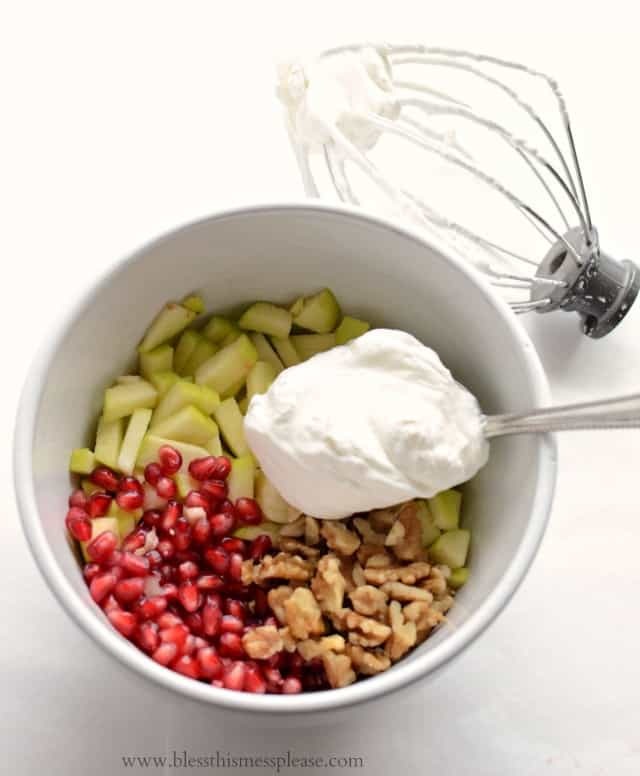 In a large bowl add the pomegranate, apple, and pecans. Whip the cream (I like using a Kitchen Aid to do this) until it turns into whipped cream, about 2 minutes. Add the powdered sugar and beat well to combine. Add the whipped cream to the fruit mixture and fold gently to combine. Transfer to a serving dish and enjoy right away. Garnish with additional fruit and nuts if desired. Store any leftovers covered in the fridge for up to a day. 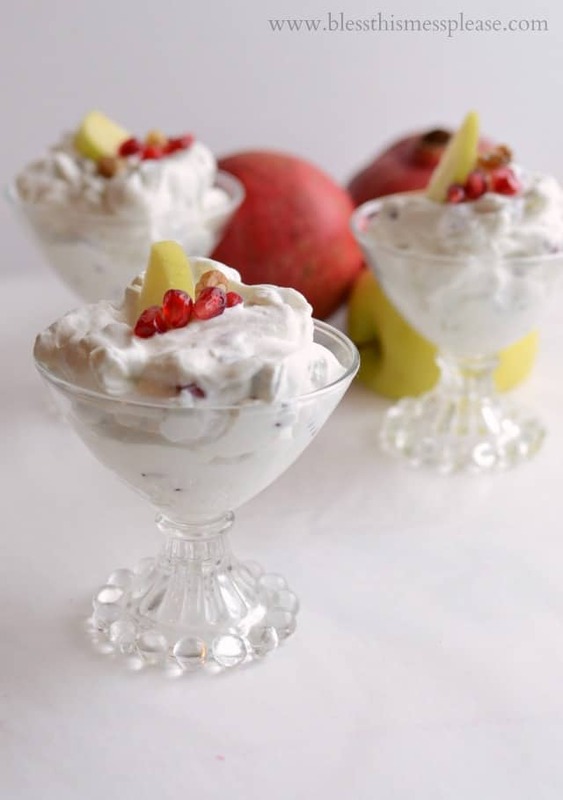 You can never have too many pomegranate recipes! 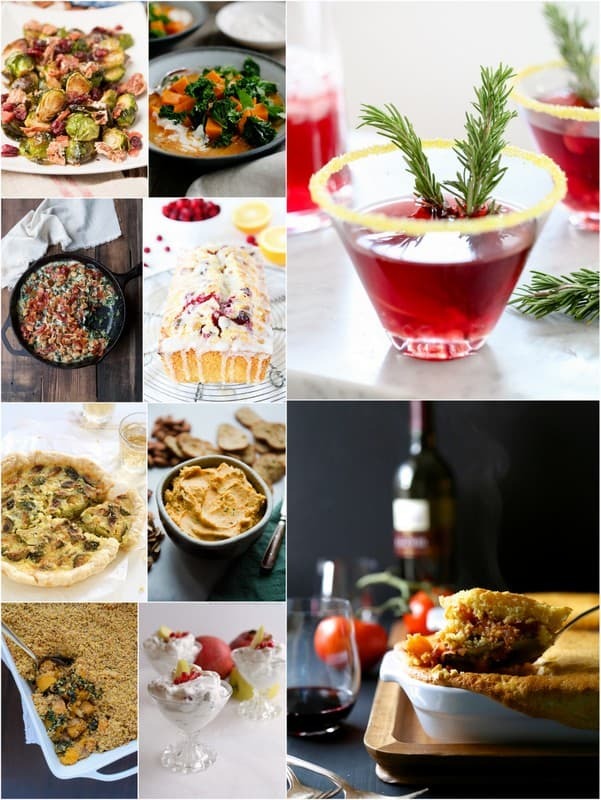 Here are the other seasonal recipes being posted today. They look fabulous! And because a little reminder never hurts. Here’s a great list of what is in season right now. This image was put together by Becky at Vintage Mixer. You can check out her post here where you can download the image as your computer home screen and also an image for your phone wallpaper. That way when you are out shopping, you’ll have your list with you! Wasn’t that a great post! I’m now motivated to make something with persimmons and cranberries this week if I can get my hands on some! 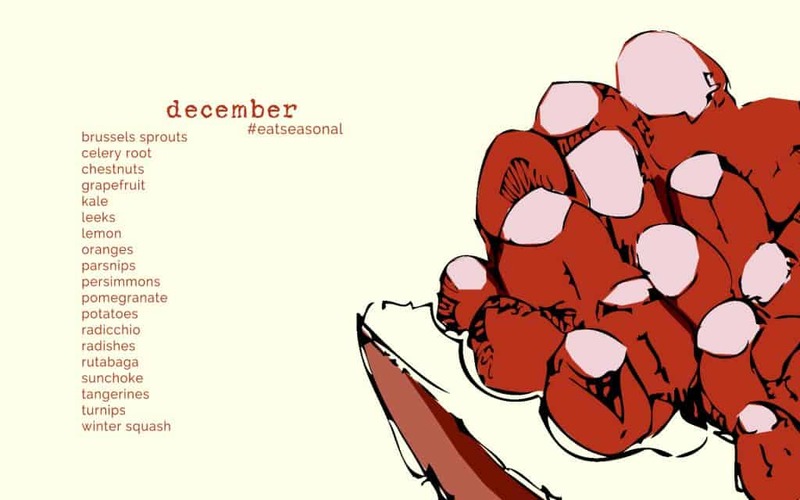 Enjoy all the recipes and the list of December’s bounty. Thank you so much for being here, you make this part of my life wonderful. I WAS SO EXCITED TO SEE THIS POST! My mom’s family is from St. George and this is our Thanksgiving and Christmas tradition, and this is the closest recipe to what we have that I’ve seen. We also add raisins…I’m not sure why except that is just how my grandparents did it…TRADITION! Every single person in my immediate family LOVES it, and it is the first dish to disappear at those lovely feasts. 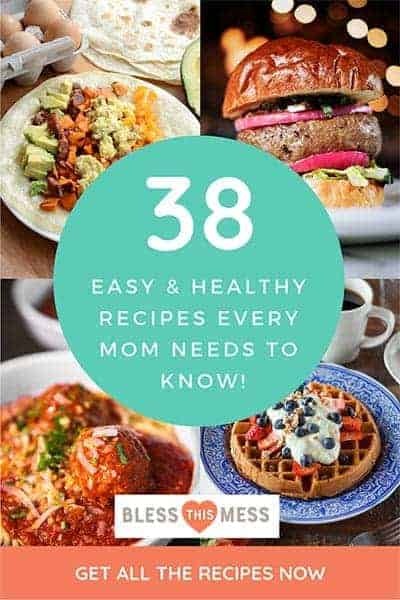 It is simple and with all that fruit and the nuts you can practically rationalize it as one of the healthier items at these meals. It brings back so many good memories. Thanks! I love your history! We have a bumper crop of pomegranates this year, however it is “the off year” for our pecans. We moved down here from SLC and are loving our unique trees. We will be making this salad for our holidays, thanks! It’s a Southern Utah specialty and you will LOVE it! I was playing with it and added a bit of fresh orange zest (obviously not locally grown) and it was excellent. Enjoy! At one time, it was also commonly served in the food booths at the Manti Pageant. I guess that they would freeze the seeds in the fall to serve the next year.